Tara is doing well and improving daily. Today is the one-year anniversary of the tragic accident that took Thad Goodman's life and altered the life paths of Tara and Josh. We have not updated this site for many months because Tara and Josh have desired to have some "quiet time" to work on rebuilding their lives. Once again, they wish to thank all the countless people that have helped, supported and donated to them in their time of need. Today, reporter Connie Skipitares of the San Jose Mercury News did another excellent news article on Tara and Josh titled "After brush with death, life's sweet". Thanks again Connie! March 8th: Tara turned 21. Her family celebrated with a big dinner and lots of thanks that she was here for her birthday. March 23rd: Reporter Grant Shellen of the Los Gatos Weekly Times (Tara's hometown newspaper) did another article on Tara and Josh titled "Tara and Josh trying to get back to normal". May 7th: Tara and Josh returned to Colorado for a weekend visit so that Tara could participate in the graduation ceremonies at Colorado Christian University. When Tara graduated a year ago, she was one course short of completion of her requirements and had intended to take that course over the summer. The accident changed those plans. 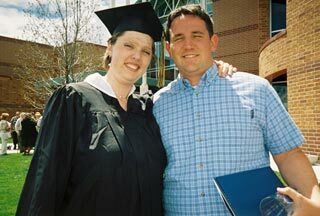 This winter, Tara completed the required course and returned to CCU to participate in the graduation ceremonies. This was a wonderful experience for her, since she still does not have any memories of the several months before the accident, so now she has the memories of her college graduation. May 22nd: Tara and Josh celebrated their one-year wedding anniversary. This year has been a long journey for the both of us. We could not have made it through this year without our friends and family. We could also not have made it through this year without support from our churches and from the prayers of everyone. There are so many people to thank and I feel like our biggest mistake in all of this was not stopping enough to say thank you to everyone who has supported us financially and through prayer and encouragement. There are some people I can’t even begin to think of how to thank because they have given so much of themselves to us. I can’t believe that people have cared so much about us and even if we haven’t been great about thanking people we are truly grateful. We always will be. Tara and I have had some very rough times over this past year and have some still to come, but we have been blessed many times over this year. God has been faithful in our lives and taken care of us and our families. I am currently working at a school doing maintenance and volunteering with our local youth group. Tara was working for a short time at a coffee shop, but found that the stress and activity of it was a little too much for her. She is still working on different social skills and still dealing with the effects of a serious brain injury. From my point of view, it is a joy to be around her and her love for life is infectious. She always finds a way to make people laugh and bring a smile to people’s faces. I can’t imagine how hard it is for her to deal with all of this and still have such a positive attitude. We are both not sure what the future holds, but it sure looks bright (at least as far as we can see). We are just waiting to see what the next step in our lives will be and are glad to just be alive. Tara just recently graduated again and there is still a chance in the future we will have another wedding. Tara is still unable to remember the first one, which is unfortunate because it was so beautiful. On our one year anniversary we sat together and watched the wedding video. 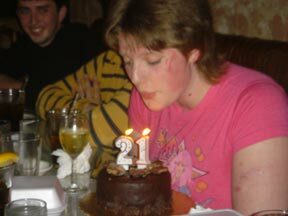 And yes the cake was pretty gross from our freezer. I forgot just how happy she was on that day and how excited she was to get married. For now we continue to wake up every day and piece things back together and enjoy year two of our marriage. Again we thank everyone for their prayers and support and are in debt to all of you for as long as we are alive. Thank you so much. 3:00 pm Tara and Josh have written a THANK YOU to all the countless people that have helped, supported and donated to them in their time of need. Please take the time to read their words at the THANK YOU link. Last month, Calvary Church had Tara and Josh participate in the Sunday services, using their story to help illustrate the day's sermon. Here is a link to the VIDEO that was used in the service. The 5 minute long video will take about a minute to download if you have a high-speed connection, and can take as much as 30 minutes if you have a dial-up line. We hope you enjoy the VIDEO. It should launch and play in your computer's media player once you click on the link and it buffers. Turn up the volume on your computer's speakers. It has been over a month since our last status report. It is amazing how things have changed since a few months ago when we were posting several status reports a day, and how we were waiting every day for some sign of change in Tara's condition. Tara is doing very well and improving daily. She and Josh have settled into the routine of their married life. Tara is still attending her therapy sessions and is doing very well. Josh has started working at Valley Christian School in San Jose, a job he had before he moved to Colorado to be near Tara as she completed her college. We want to express our special thanks to Shanna and Chris Schriner, owners of The Pond Shack who raised $1,800 for Tara's Recovery Fund with their Moonlight Pond Tour. We also wish to thank Marnie and Andy Bivetto, owners of The Los Gatos Company who auctioned a hand-made life-sized Halloween Witch and raised $400 for Tara and Josh's fund. Their store in downtown Los Gatos has a truly beautiful collection of art, crafts and gifts. Thank you to The Pond Shack and to the Los Gatos Company for you kindness and generosity. Your friendly reporter has taken time off from this website this past month to do some of his own healing. Most importantly he is overjoyed at the miraculous recovery of his daughter and wishes to express his and both families thanks to all of you that have helped in Josh and Tara's recovery through your prayers and support. Your reporter can be reached, if needed, at john@eichinger.com. We will continue to update this site periodically when events warrant it and will notify all those that have signed the guestbook via email of important updates. Please take the time to read Tara and Josh's THANK YOU and view their VIDEO. You can email Tara and Josh at info@tarajosh.com or sign their guestbook. Thanks!